The other day I was craving bread and butter pickles and, when I saw pickling cucumbers at the farmer's market, I decided to satisfy that craving. I located the recipe immediately in my obsessive recipe filing system and set out to gather the ingredients. Somewhere along the way, the recipe disappeared! I looked for hours, then days, to no avail. Gone! When I mentioned it to Mother, she remembered the recipe and said she still had a copy. The next morning she called to read it to me. Finally! I set out again to collect the ingredients and a bowl. Of course, there under the bowl in the pull out cabinet drawer, was the original copy of the recipe! Now I am enjoying my bread and butter pickles even more than I thought I would. And so I say, "Thank you so very much for sharing your recipe with Mother and me so many years ago!" They are the BEST! Save that recipe! I cannot find mine. We used to serve those pickles as a vegetable side dish and eat a load of them. Maybe it is the sugar that makes them so good. Thanks for telling me you like them too. All I have to add to the story is the testimonial of my friend and neighbor, Jim, who consumed the entire container I dished up and delivered to him. While we enjoyed one of this summer's incredibly pleasant evenings out under the big tree in Jim's backyard -- aka The Martini Lounge -- Jim ate every single pickle in the container I gave him and then, as he handed it back, he said, "You can fill it up again." 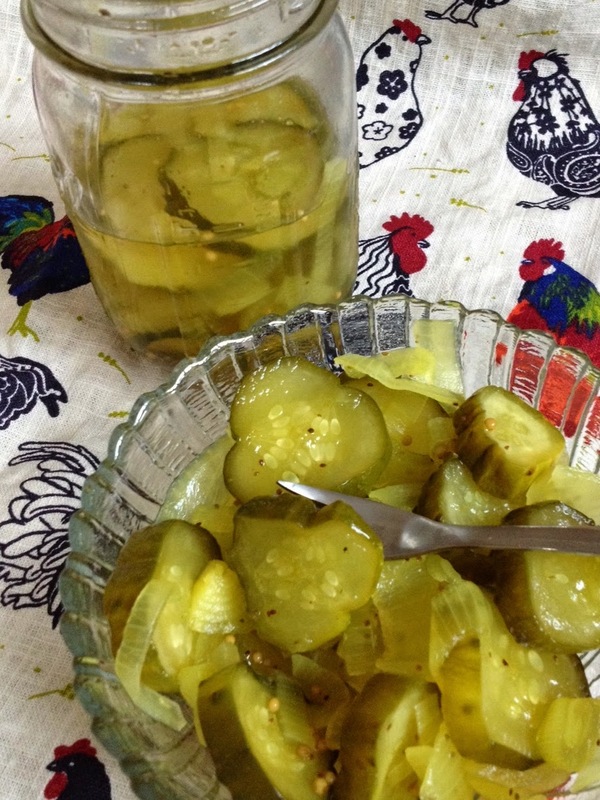 And just tonight, when I talked to my husband, who is out on a trip, he told me he had shared the pickle story with his First Officer and assured him he could get the recipe on my blog. Uh, oh! I've been so busy making pickles, eating pickles, sharing pickles and emailing about pickles -- I forgot to tell you the story! So here goes ... and if you should copy this recipe and lose it, you'll know exactly where to find it -- right here. Pickles are best after a day or two in the refrigerator and will keep for several weeks -- if they last that long!